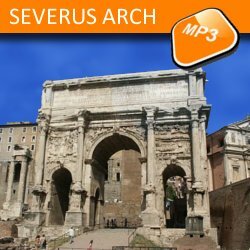 Description: The Arch of Septimius Severus is one of the two remaining triumphal arches of the Roman Forum. It spans the Via Sacra on the route of the triumphal processions just before the ascent of the Capitoline Hill towards the Temple of Jupiter. The triumphal arch was built in 203 A.D. to commemorate the two victories of emperor Septimius Severus and his sons Caracalla and Geta in the former Parthia (now mostly Iran territory). With this tour you will enjoy the splendour of the Roman empire. The first stop will be the Colosseum, probably the most important Roman symbol and one of the top attraction of the city. The tour proceeds to the most important Roman arches, the arch of Constantine, the arch of Titus and the arch of Septimus Severus.